I’m not sure why but right now there is a real interest in aluminum production or semi-production yachts built in Europe. I like aluminum construction. It is, maybe even including wood, the prettiest of all the materials during the build stage with a shiny, smooth aluminum surface to all the structure. In some cases it is pure yacht eye candy. But aluminum has practical advantages too. Does aluminum have drawbacks? Yes. It does not like paint and with the wrong electrical system improperly grounded it can quickly become a battery and your dream boat can become a nightmare. Naval architecture credit for the 45.9 goes to Berret Racoupeau. Interior layout and styling is by Frank Darnet Design. The structural design is by the Allures yard. 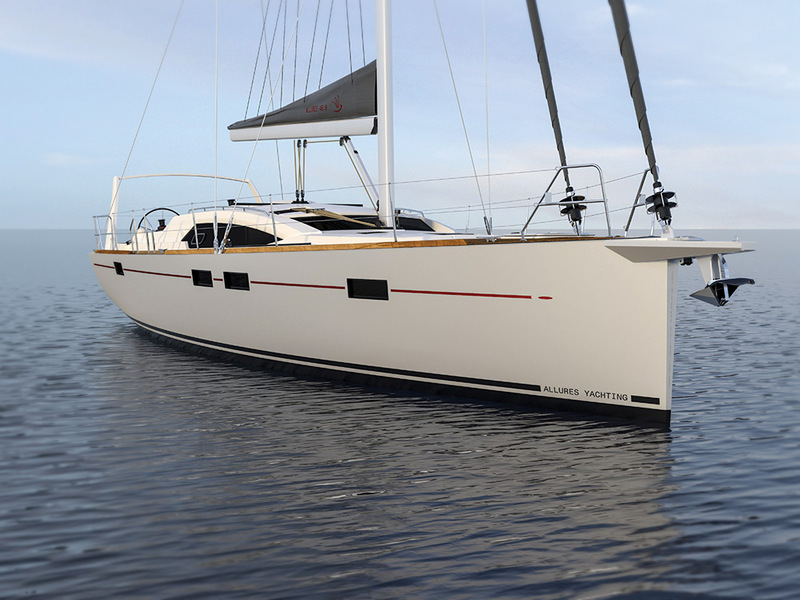 The Allures 45.9 is the boat of options. This probably has a lot to do with the semicustom nature of the build. There are no confining molds to work with that you would have with a GRP boat. Changes can be made in major components. For instance, the 45.9 comes with either a centerboard that retracts into a wedgelike fin for a board-up draft of 3 feet 5 inches or a lifting-bulb keel that retracts for a keel up draft of 4 feet 9 inches. Twin rudders ensure good control with the shoal draft. The D/L is 165 and the L/B is 3.09. It’s a nice looking hull with minimal overhangs and a broad stern. The freeboard is high but the boat carries it well. Unfortunately having a plumb stem requires an elongated “platform” on the bow to get the anchor rollers away from the stem. This mini-sprit can also be used to tack your asymmetrical chute, but to my eye it does not contribute to the look of the boat in a positive way. Why not just add a few feet of forward overhang, add some deck space forward and gain the room you need for the anchor to clear the stem? If you want interior options, this is the boat. To start with there are three basic layouts. Then there are variations on the basics. Version 1 has two double cabins, a bonus area called a technical room and one large head aft. Version 2 has two double cabins, one forward head, one double bunk bed cabin and a large aft head. 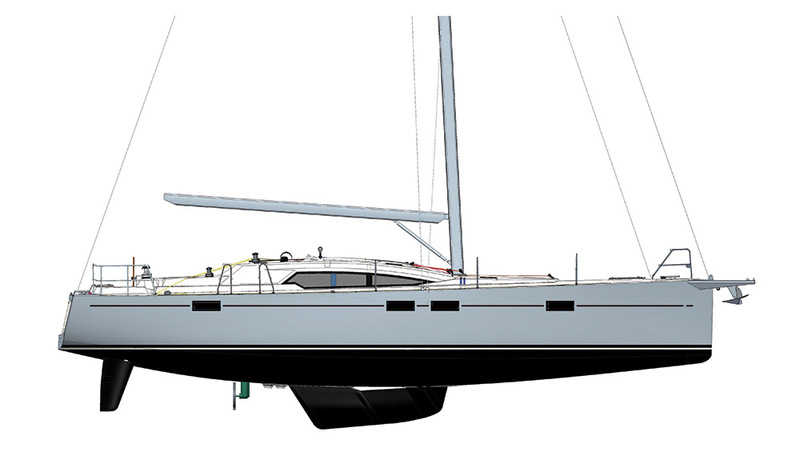 Version 3 has three double cabins and two heads, forward and aft. I like this one. Now you can choose from a V-berth double or separate single V-berths. You can have a standard aft head or a large aft head. You can even choose how you want to deal with the “technical room.” It can be stacked berths, a double or a work bench. I think it’s safe to say that you are going to find one combination of interior features that will work very well for you. I’m not wild about the main cabin with its longitudinal galley but maybe I’m nit-picking. Fixed windows in the hull will provide lots of light below. There are options available in the rig also. The basic rig has a SA/D of 18.77 using the lightship displacement of 27,778 pounds. 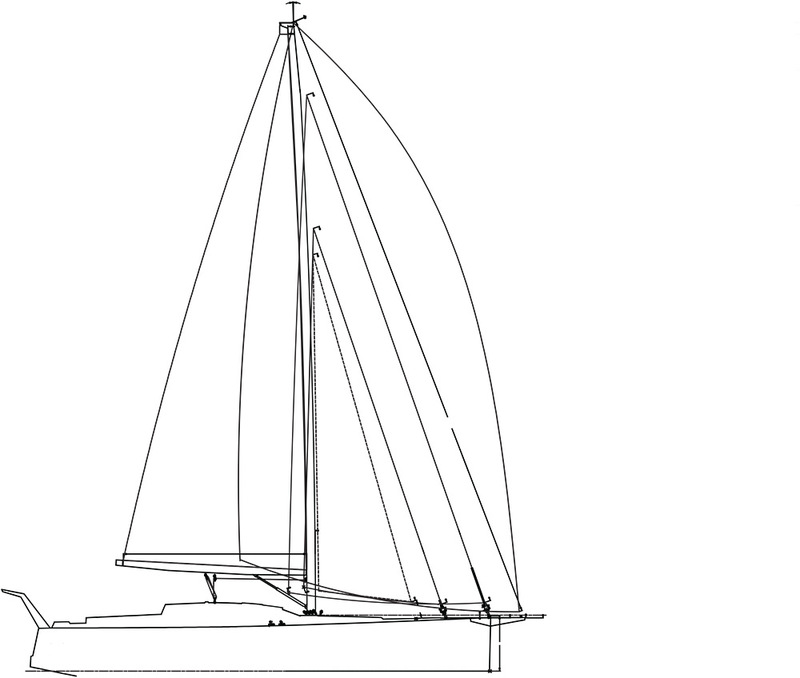 The foretriangle is drawn with three tack points for jibs, one at the stem, one aft in the typical staysail tack location and another farther aft for a storm staysail. Then there is that mini-sprit where you can tack an asymmetrical or a code zero sail. This a very nicely styled aluminum boat. LOA 48’4”; LWL 44’11”; Beam 14’6”; Draft 3’5” to 9’6”; Displ. 27,778 lbs. ; Ballast 10,538 lbs. ; Sail area 1,076 sq. ft.; SA/D 18.77; D/L 165; L/B 3.09; Auxiliary 55-hp Volvo Penta; Fuel 165 gal. ; Water 110 gal.